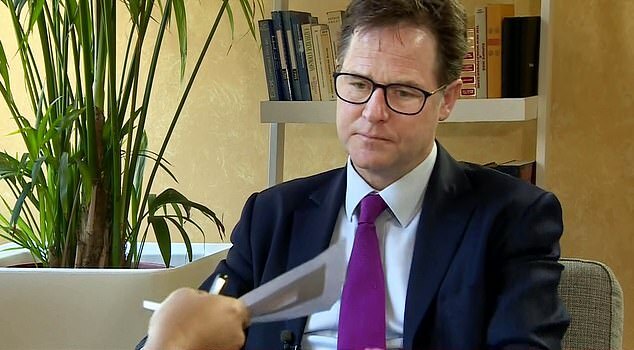 Sir Nick Clegg began his new job spinning for Facebook yesterday by claiming it has been a force for good that has helped save thousands of troubled young people. Confronted with an array of gruesome images found on Instagram – which is owned by the US social media giant – the former deputy prime minister said some posts help those in distress to find support. The sickening pictures he was shown during a BBC interview included graphic images of self-harm that can be accessed by children. The former Liberal Democrat leader promised Facebook will do ‘whatever it takes’ to make its sites safer. But last night he faced accusations he has ‘clearly already drunk the Facebook Kool-Aid’ as he defended a company criticised for repeatedly failing to meet its pledges to remove horrific posts that glorify self-harm and suicide. In his first public comments as vice president of global affairs at Facebook, Sir Nick admitted it ‘had a lot more work to do’ about the thousands of such images that are still available. 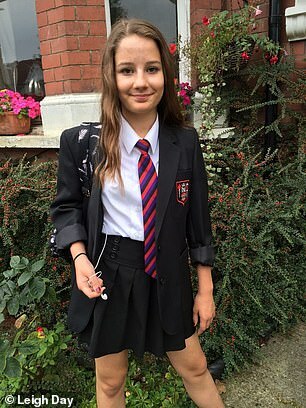 The father of 14-year-old Molly Russell, who took her life after viewing posts about suicide, last week accused Instagram of playing a part in her death. Sir Nick, who has bought a £7million home in San Francisco as a base for his lawyer wife Miriam Gonzalez Durantez, 50, and their sons while he works for Facebook, told the BBC: ‘It is as distressing to me as anyone to have heard about the awful tragic cases of teenagers taking their lives in the way that has come to light in recent days. ‘What we have to do is look at this from top to bottom, without any prejudice we will do whatever it takes to try and make this environment safer online, particularly for youngsters. He argued that some experts had advised that it is wise to keep certain images up because they can show how to find support. ‘At the moment, they have said that even some of these distressing images are better to keep if it helps young people reach out for help,’ he said. Facebook’s billionaire founder Mark Zuckerberg, 34, hired Sir Nick at a time when his firm’s reputation is in tatters and governments across the world want web giants to be regulated. Sir Nick’s appointment in October was met with criticism, with some accusing him of hypocrisy having previously poured scorn on Facebook for paying too little tax. Less than three years ago he described its ‘messianic Californian new-worldy-touchy-feely culture’ as ‘a little grating’. Yesterday Sir Nick said he believed the company should pay more tax outside of the US but said the onus was on governments to change the rules. He also defended Facebook’s business model of using personal data to sell targeted advertising – rather than charging users a subscription, which some would be unable to afford. The collection and sharing of personal data, such as users’ location, shopping habits and holiday plans, was now ‘routine’ among many private companies and public sector organisations, Sir Nick said. Instagram has damaged the mental health of many of its users, a survey shows. Endless glossy pictures depicting the supposedly ‘perfect lives’ of others have made two in three of its estimated 23million monthly UK photo-sharers feel irrelevant and unhappy. By comparison, around a third of Facebook account holders feel negatively about the site and a fifth of those on Twitter. Researchers commissioned by MoneySaving-Heroes.co.uk examined the impact of regular use on 2,421 Britons aged 18 and over. More than half said the minimum age for access to social media sites should be increased to at least 16. Later, during a speech in Brussels, Sir Nick said that while Facebook’s fast growth meant it had ‘undoubtedly made mistakes’, the site had learned some ‘hard lessons’ and was now entering a new phase of ‘reform, responsibility and change’. ‘Everyone has a role in this. Facebook doesn’t have all the answers,’ he added. In an interview on Radio 4, Mr Collins added: ‘In terms of what he had to say, he did not really say anything different to Facebook executives have been saying for some time, which is to express regret when they are caught out. ‘But we have been raising these sorts of issues for years, there have been other cases of harmful content that has been available to vulnerable people, and the company always say ‘Well it should not be there and we will do better’, but they never do.